Sunday and snacking don’t go together for me. I’m talking just about the preparing part and not the eating of course. So when it comes to Sundays and snacks, I have got to make it in advance. So this recipe comes in handy. I was inspired by Jenna of Delicious Daydreamers. She had posted the roasted chick pea and we had even discussed if it could be done on a microwave. So last Saturday I tried it using the microwave and it turned out super crisp! The lazy me, I reserved it for Sunday snacking without the hassle of even going into the kitchen. Not that it is difficult to do it on a Sunday, but having something healthy to snack without entering the kitchen is surely tempting. Soak the peas in water for 8-10 hours. Drain the water and dry it on a paper towel to remove excess moisture. Spread it on a plate and microwave on high for about 2 minutes. Take it out and add oil, salt and the various spices and microwave on high till it is crisp. You might have to wait until it cools down to check if it has turned crispy. If you feel it is not as crispy as you want, microwave for a few seconds more for it to reach the perfectness that you expect. It took 8.5 minutes in my microwave with 100% power (i.e. 900 watts). Adjust the timing according to your microwave, but be careful, since even 1 minute more than necessary in the microwave could turn your beautiful roasted peas into burnt ones. So it is always better to set a shorter time in the microwave, check the crispness of the peas, and then put them back if they are not done. Crisp and healthy snack is ready to serve. 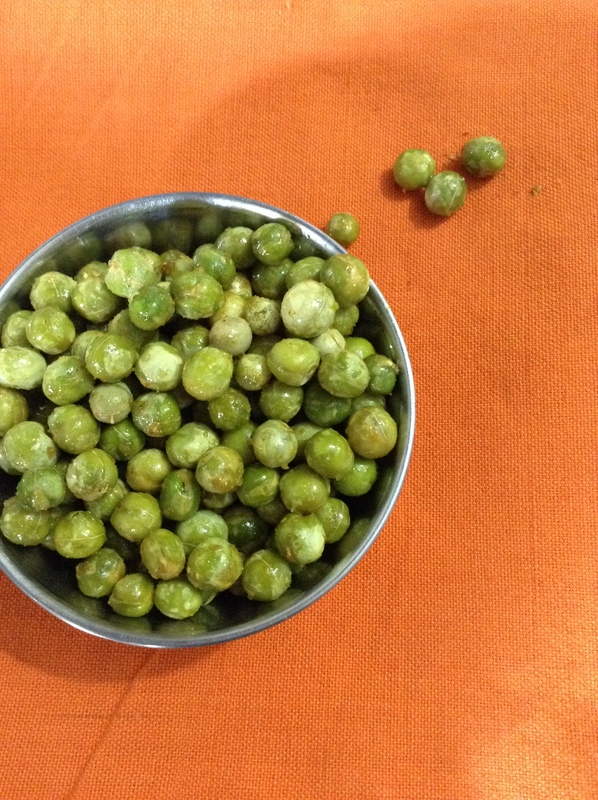 Dried whole peas is the fully mature, dried form of fresh peas. This legume, like others, is very rich in soluble fibre and hence helps lower cholesterol. Dried peas are the perfect substitute when fresh peas are not available. 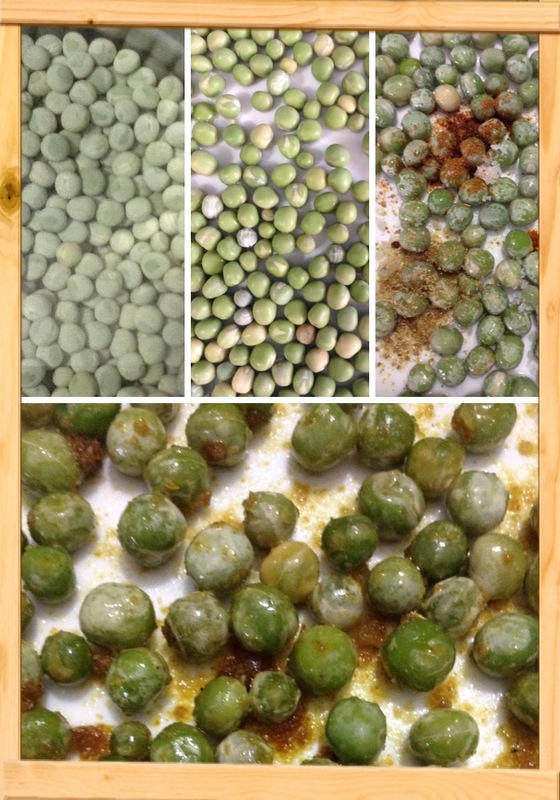 How to Buy Pre-packed dry peas are available in stores. Check for impurities and bugs before buying. Storage Always store in an airtight container in a cool and dry place. Refrigerate or rather freeze them to increase the shelf life drastically. Usage Soak them for 8 -10 hours before cooking. If you don’t have that much time, soak it in hot water for 2 -3 hours.